London - South Africa's Arnu Fourie bagged the bronze medal in the men’s 100m T44 final, finishing ahead of compatriot Oscar Pistorius at the Paralympic Games on Thursday night. 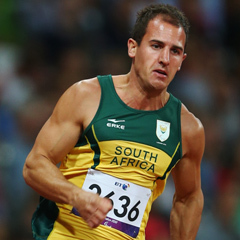 Fourie, winning South Africa’s fourth medal of the day, set a new regional record in 11.08 seconds, while Pistorius ran in a close fourth with a season’s best of 11.18. Jonnie Peacock ran a personal best 10.90 seconds and blue and red lights lit up the stadium in the host nation’s colours to celebrate his gold medal. Richard Browne of the US won silver in 11.03. In the customary silence before the race started, the tension mounted even further when Alan Oliveira, gold medal winner in the 200m T44 final, stumbled over the line before the gun. The race had to be restarted and the Brazilian ended in seventh place, in 11.33. Earlier, Natalie du Toit won her third gold medal in the pool in her swansong appearance in all forms of competitive swimming. Slow out of the blocks as usual, Du Toit improved with every length to win the women’s 200m individual medley SM9 by almost two clear seconds in 2:34.22. Representing the host nation, Stephanie Millward took the silver medal in 2:36.21 and Louise Watkin the bronze in 2:37.79. There was no going back for Du Toit, who would swim her last ever competitive race, the 100m freestyle S9 on Friday. “I’m sad but also relieved, as well as a little bit scared,” she said. “I think scared because I have no idea what I’m going to do with myself. “I’m also nervous for the race because I’m not swimming so well and those girls have really improved, especially in the 100s and 50s. “So, I’ve got to try my best to walk away with a medal and it will be very special being my last competition. Hilton Langenhoven from Stellenbosch won the silver medal in the men’s 400m T12 track final in a personal best time of 49.04 seconds. Leading into the straight, he faded in the last 20m to be overtaken by Mahmoud Khaldi of Tunisia, who set a new world record of 48.52 to win the gold medal. “Naturally I would have loved to win the gold medal but I’m still very happy with the silver," Langenhoven said. “I couldn’t have lost to a better person. Mahmoud came very strong on the home straight and congratulations to him. “I’m very proud as it was a personal best for me, so the medal is just a cherry on top. “There was a head wind at the back and I really had to push to get the advantage. Ilse Hayes took the silver medal in the women’s 100m T13 final in 12.41 seconds. Omara Durand from Cuba won the gold medal in 12 seconds flat while third place went to France’s Nantenin Keita in 12.47. “I injured my quad about a month ago, so my preparations were not very good coming into the Games,” said Hayes, who ran with tight strapping around her left thigh. Johanna Pretorius, running in the same final, held up the rear to clock 13.50. Teboho Mokgalagadi finished fifth in the men’s 200m T35 final, in a personal best time of 27.02 seconds. The race was won by Ukrainian Iurii Tsaruk who left the field in his wake after setting a new world record of 25.86. Zandile Nhlapo was eliminated after three rounds in the women’s shot put F32/33/34 final with her best heave at 6.41m. Germany’s Birgit Kober took the gold medal with her best throw at 10.25 and her nearest rival was Australia’s Louise Ellery a poor second in comparison at 5.90. As with all the field events, a points system factors in the athlete’s distance against their level of disability, leaving Nhlapo, who suffers with cerebral palsy, placed 12th overall. At Brands Hatch, Jaco Nel crashed out of the men’s individual C1-3 road race, and was one of 14 cyclists not to finish. Roberta Bargna of Italy took the gold completing his race in 1:42.51. With South Africa’s four-medal haul on Thursday night, the team remained in 20th position, with a total of 21 medals, comprising five gold, seven silver and nine bronze.